I was reflecting the other day on the Noble Eightfold Path, and it occurred to me that much of buddhism is about being other, being better. It sets certain goals for you and expects you to apply effort and dedication to changing yourself. I find it at once inspiring and slightly uncomfortable. It contrasts sharply with the Tao, which is more concerned with an “acceptance of things as they are”. I find that a very beautiful avenue of growth and self-discovery as well. It is more passive, less goal-oriented and because of that more open-ended. It is of course a question of skilful means and applying what teaching is appropriate, and different styles of Buddhism have a different take on this. But I find the mixture quite beautiful, and useful. Some people say that Zen has some similarity to Taoism or so I have read. I find that the things that work best for me to navigate life and make progress (ie improve on my interactions and reactions and relationships) run the gamut, and I am happy to use all of them. I don't worry too much whether they fit exactly within Buddhism or not, but most often I find they don't conflict. Does Buddhism (or anything else) really set goals for you and have expectations of you? I don't think so. That's just more of all the stuff that's in our mind. Buddha said for a reason to not blindly trust teachers and teachings and to investigate the truth they offer in your life. If you don't find truth, don't accept it. I don't particularly find the acceptance of things as they are in such sharp contrast though. It depends on how you look at it. Being present has always been an important theme within Buddhism, and I don't see that as any different from accepting things as they are. The problem comes in when we look ahead (or behind) and make comparisons and as soon as we do that, we are no longer in the present, and we're not longer truly seeing things as they are. Because we've shifted to seeing them as they were, or as we think they should be. Doing so is very much a human experience, and we pretty much have to do that to learn lessons and to make progress. But usually when I look at things as inspiration (such as inspiring to be more like Buddha) I don't see them as a goal so much. I don't have a plan with steps that end in "Be a buddha!" because my goal is just improving. I guess I don't run my spiritual life as much like I do planning for a trip where ther eis a tangible goal with projects and tasks along the way. There is a time for learning from the past and looking to the future, but most people consistently live in a manner that is looking forward instead of now, and when you do that, you never get to any of your goals because the goal post are always shifting. Aww shucks, now I might as well toss my 12-point plan that ended with “be a Buddha!” As usual you contribute some sensible and insightful points @karasti ... The notion that Buddhism wants you to be something — an adherent to the five precepts, a follower of the noble eightfold path, a practitioner of mindfulness, a student of the dharma — seems to crop up in a few places though. But, and this might be picking nits a bit but it's what comes to mind, , Buddhism at this point is a system of wisdom and information. how can it want or expect anything of you? Teachers might, for sure. But we definitely have a choice in which teachers we give our devotion to. But Buddhism itself? It's just there for us to do what we wish with, just like kitchen tools. The pizza cutter has no expectations of me. If I use it for something that isn't a pizza, i doubt the pizza cutter will know or care. It's just there. Any expectations or limitations I place on it are mine. Then how do you handle the teachings saying “do this!” and “don’t do that!” and “be this!” and “don’t be that!” Take the N8FP rules on right speech, for instance. Even the Athakavagga had many lines that said, the sage is not like this, all hints of behaviour to avoid or growth to encourage. It’s a system of wisdom and information, yes, but it’s largely directive one that pushes you towards certain behaviour. And perhaps that’s a trait shared by most religions. Certainly Christianity has its own set of rules and expected behaviour, as does Judaism or most of the others. I just find it useful to practice radical acceptance sometimes, interspersed with Buddhist behaviour modification. I think they complement eachother very well. Osho was also much in that way, he often spoke of other traditions with great love. I do take your point about ‘testing the truth of the teachings’, but I get the feeling from the way it’s written that certain core teachings like the N8FP are non-negotiable. In addition to accepting oneself as is, Daoists have preferred to focus on understanding the nature of reality, increasing their longevity, ordering life morally, and regulating consciousness and diet. 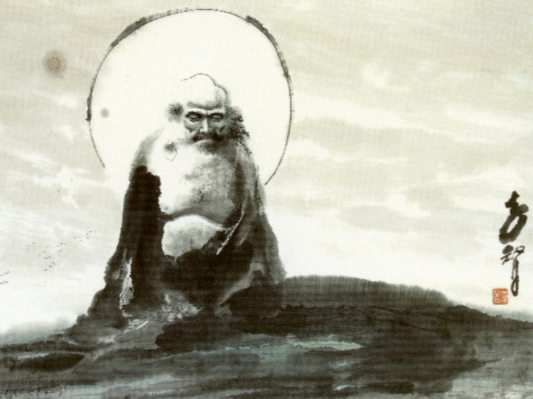 So despite the "to be" vs "just be" labels, the similarities between Zen and Dao are significant, as Bodhidharma was essentially a Daoist and a patriarch of Chan (Zen as we know it). Realizing the Dao is probably similar to realizing the Dhamma. The only issue is, we don't start out with that knowledge because it's obscured by what Buddhism calls defilements. Being content and accepting things as they are is good from a certain POV, but we wouldn't necessarily want to do that when 'things as they are,' i.e., the contents of our minds, are essentially polluted or coloured by greed, anger, and delusion. If I'm an angry person who beats my spouse, for example, I'd hope I wouldn't just accept that as is but try to uproot the anger that causes such suffering to myself and others. What we should come to accept is the nature of phenomena, its arising and ceasing, its impermanent and selfless nature, etc. And part of the path to that kind of acceptance is the process of uprooting the mental defilements that prevent us from seeing and accepting that reality. When we're tied by self-centredness, we're susceptible to their rule and can't see beyond our sense of self, our likes and dislikes, etc. But when we pierce that veil, we see the Dao, Dhamma, and it all falls away, leaving a bright, clear mind and an acceptance of things as they are. So from that POV, I see Buddhism and Daoism as complimentary and can be likened to different fingers pointing towards the same moon. @Kerome I've never really seen it (the Eightfold path) as a list of "do this and don't do that." To me, all of Buddhism isn't really meant to be a map. It was an experience shared by someone who attained that level of wisdom. The rest of us also have to attain it. But did Guatama become Buddha by practicing, say, Right Speech? It doesn't seem so. He became Buddha but cutting through all the crap in the mind, and then tried to tell us what he knew what the right way to live, but attained via wisdom not because someone else said so. He didn't realize the importance of the Eightfold Path until he obtained the wisdom that went into understanding it. My teacher always explained the Eightfold path as not something intended to be seen as "correct" or "not correct" behavior, but rather wise and unwise behavior. Similar to how "sin" really means to "miss the mark" not to be an evil person. The problem, whether Buddhism or the 10 commandments or anything else is that no matter what someone else shares we still have to come by the reasoning for it ourselves. Someone can tell us not to kill someone else, and some of us will follow that rule simply because we are told it's bad and we shouldn't do it. But why shouldn't we do it? When you delve into the whys of good or bad behaviors, that is where the wisdom really comes from. Not anyone else. Not ever anyone else. We have to realize it all ourselves. Otherwise we are simply following rules and not living values. Sometimes when we practice following the rules, we arrive at the wisdom that turns it into morals/values. Sometimes we need to listen to someone smarter than us to prevent problems. But to truly grasp it we have to come to that understanding/wisdom on our own. I try to remember that just like Christianity, Buddhism is a story, told from the perspective of people who were not the Buddha. It seems more likely to me that people like Buddha and Jesus were simply sharing their experience and the wisdom they attained via a community and like so often happens with people, when something blows our minds, we want to share it with everyone, whether they are ready or not to hear it. It seems entirely possible to me that most of the people Buddha taught were people ripe to have their minds blown, but as it almost always the case, wisdom has to be experienced, not just presented. Turning wisdom into words changes it into nothing but information. The mind blowing part happens when we can take information and turn it into wisdom, and I think that was probably Buddha's intent. Not meant so much to make us follow rules because doing A, B and C will ensure we arrive at Z. But because you never know what bits of information will unlock wisdom within ourselves. and why it takes 86,000 volumes of teachings to contain the 4 noble truths and the Eightfold path. All of the teachings come back to those simple things. But what information allows someone to see the wisdom of those simple things is going to vary widely. I really should have written this out before I shared it. If I had time, I'd do it now but I have Christmas cookies to finish up, so, sorry for my random blatherings and ramblings. They don't quite say what comes to mind but perhaps in the morning when I am quiet and not addled with holiday plans it'll make more sense and I can fine tune it. I like the Tao. Going with The Way, relaxing in yoga, being enlightenish etc all make fine hobbies. Being a Taoisty kind of Buddhist I can totally understand your conclusion but I differ with your analysis. It contrasts sharply with the Tao, which is more concerned with an “acceptance of things as they are”. This to me sounds like there is no discipline to Taoism but that's just not so. There is much more to it than acceptance because first one must understand how things are and then learn to act in accordance with the way things are until it becomes graceful or second (or even first) nature. Then we can act as water flows without having to think about it. I don't want to be presumptuous but it could be the translation of the Eightfold Path as Right view, right resolve, right speech, right conduct, right livelihood, right effort, right mindfulness and right samadhi. Since each aspect of the 8FP is represented by a spoke on the wheel, it makes sense they each work in concert. It flows more naturally seen as the 8 harmonious spokes and then rather than Right effort we have harmonious effort. If each spoke is as nurtured as the others, it won't collapse its part of wheel as it rolls closest to the ground. I find that a very beautiful avenue of growth and self-discovery as well. It is more passive, less goal-oriented and because of that more open-ended. But it is fairly goal oriented and much of the teachings are about how the virtuous or skillful behaves or sees. Chapter 8 of the Tao Te Ching makes being like water sound easy but just because it sounds simple does not make it easy. So do I. I am not strictly Zen but non-sectarian and my shrine here has Buddha and Lao-Tzu. Still looking for Tara (preferably 2 aspects) and Nagarjuna. The Tao, Emptiness, Buddha nature and the unborn is all the same thing conceived of differently by the way I see it. I think “things as they are” is an integral part of Buddhism. How could there be insight otherwise? To me the difference is between the words acceptance and acknowledgment. Leaning toward the latter makes space for resolve, which pays closer attention to the interconnections between things as they are, e.g., the braid of perception and feeling. Fall into the trap, lean back. That, I think, coupled with intention, is from where skillful means actually comes, from acknowledging things and their interconnections as they are. I think for me it's more a try to see things as they are and examine mental constructs I have made over the years that might not be true. When you get to the point of seeing how things are I'm not sure that means to accept them. Like as humans we can change lots of things. Is acceptance more a calming method for dealing with the things that we cannot change or do not know how to change? In Buddhism, everything ultimately refers back to the mind. And the phrase seeing how things are should be really understood as seeing how the mind is. And when the nature of the mind is fully realized, there is no Tao and there are no notions of accepting and not-accepting - because there is no 'I' or 'we' to follow or to accept or to not-accept. the icon of buddha touching the earth--as my witness--is ,imo,is quintesential dao and dharma.a friend of mine once said,tao is everything.im a believer.in dharma,the gnosis,allows the interaction with the dao.the brain phenomenon can be quicker than the eye phenomenon.still trying to familiarizie this phenomenon,somewhat mystical,somewhat scary.but through dharma practice hope it settle as simple acknowledgement or as others suggest the acceptance of the dao-dharma phenomenon. "I have just three things to teach. Simplicity, patience and compassion. These are your greatest treasures. Simple in actions and thoughts you return to the source of being. Patient with both friends and enemies, you accord with the way things are. Compassionate towards yourself, you reconcile all beings." The notion that Buddhism wants you to be something — an adherent to the five precepts, a follower of the noble eightfold path, a practitioner of mindfulness, a student of the dharma — seems to crop up in a few places though. To be something is one perceptive. Another is that we are perpetual change. The metaphor of a path adds direction. Removing “right” leaves views, intentions, speech, actions, livelihood, effort, mindfulness and concentration. Nothing that isn’t already happening. Buddhism simply says this way leads here and that way leads there. Be on your way. "The fish trap exists because of the fish. Once you've gotten the fish, you can forget about the trap. The rabbit snare exists because of the rabbit. Once you've gotten the rabbit, you can forget about the snare. Words exist because of the meaning. Once you've gotten the meaning, you can forget about the words. Where can I find someone who's forgotten the words so I can talk with him?" I don't see that as a contrast because to "accept things as they are", is itself, a goal and to be able to do that often requires effort and dedication to changing yourself. For example, are you able to accept the fact that you will die? Most people have great difficulty with that! Bringing it back once again, for Buddhists, the "acceptance of things as they are" must ultimately mean the "acceptance of the mind as it is". Nansen answers: "Ordinary mind is the Way." And, as @seeker242 says, it does require effort and dedication ... but not to change yourself, but to completely reconcile the notion of anatta . Some wise words from the NB Sangha thank you all. I guess what it comes down to is that “acceptance of what is” is a process of discovery and natural growth. It is an extension in the direction in which you already growing. It requires minimal effort compared to other paths, but you might not like what you see, it’s a warts-and-all path of awareness. The Noble 8FP is a path of improvement, it sets you goals that may not have originally been part of the way you had naturally developed. This can be both a blessing and a curse, it can inspire you and spur you on to greater things, evolving you. At the same time it can also internal conflicts when you have to let go of things counter to your desires. Yeah but also "accepting what is" means knowing the correct action to take. It does not mean complacency. Maybe you’d like to illustrate that with an example? To my mind acceptance doesn’t seem to involve many choices. Wrong. Acceptance is, in itself, a choice. If you are wrongly accused at work of stealing, and for some reason, you have no alibi and the odds seem stacked against you, you may be fired and lose your job, unjustly. That is one time to 'accept' the situation as it is, but it doesn't necessarily mean you take the wrongful dismissal on the chin and lose your job. Things are what they are; the situation has arisen, and exists. But as @David correctly points out: Acceptance doesn't mean complacency. You do whatever is skilful, necessary and just, to prove your innocence, keep your job, pay the mortgage, put food on the table, settle the bills and stay working. Tai Chi is a Taoist martial art for example. If accepting things as they are means being complacent I would just get hit instead of knowing how to avoid being hit without having to think about it. Completely accepting things as they are, we are in the here and now completely. Artists and athletes call it being in the zone. I think this post might have been redundant. I think I was trying to figure out the best way to say that accepting things as they are is the same thing as being mindful. And your post reminds me of the Middle Way between craving and aversion which is also acceptance. That’s interesting, certainly a more practical and direct application than I was thinking of. In the real world making choices is unavoidable, and so accepting things as they are is only of use in certain situations. Ho hum. I'd say it's useful in all situations. Accepting things as they are includes everything such as the fact that we can affect change to a degree and that affecting change is best done skillfully. Also when we meditate and watch thoughts come and go without adding anything or taking anything away we are accepting things as they are. There are a few ways to look at it and none involve complacency in the face of skillful options. Even accepting there is nothing we can do for a situation means moving on. Accepting things as they are includes everything such as the fact that we can affect change to a degree and that affecting change is best done skillfully. Well said I totally agree. Complacency doesn’t really come into it. Acceptance of things as they are is part of seeing things truely, which is a prelude to making skilful choices. But I think accepting things as they are has a particular meaning in terms of seeing things correctly, insightfully and deeply. Many people are told to just “accept!” without understanding deeply what it is they are looking at. Acceptance of things as they are does not mean resignation... It means interacting with the present moment and being actively aware of emotions as they arise (or don't, as the case may be) and proceeding as is wise. It is eliminating the presence of the second arrow. If "accepting things as they are" is just another play on being mindful, and/or being present, it doesn't mean not making choices when they are presented. If you can manage to remain mindful when a choice is offered then you are able to make the right choice without having to spend forever thinking about "what ifs" or trying to untangle the whole mess. Being mindful keeps you in the right place to respond to people, situations, and yes, choices. Geez, I totally goofed there. Complacency is not the term I'm thinking of and for the life of me I can't fetch the proper one. Maybe apathy?